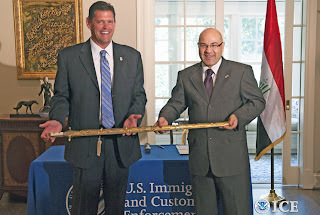 Yesterday the Department of Homeland Security (DHS) issued a press release stating that it had returned a sword "looted in 2003 from Saddam Hussein's personal office in Baghdad" to the government of Iraq at "a private ceremony" and the residence of the Iraqi Ambassador to the United States in D.C. This, in fact, is the very same Saddam sword I had discussed in a post last year called "Actually, That Might be Saddam's Sword After All" which was a response to Spencer Ackerman's piece "Sorry, That's Not Really Saddam's Sword You're Buying." 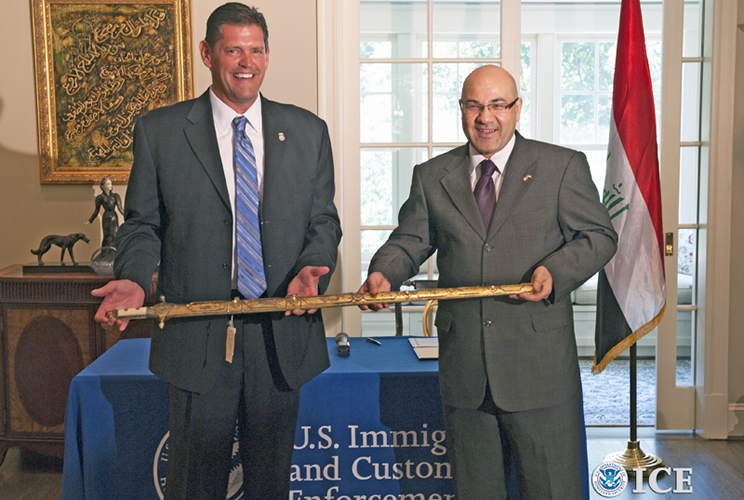 As background, apparently after hearing that it had been auctioned in early 2012 in New Hampshire (the auction house description has been taken down, but thanks to the Internet Archive the text is here), the U.S. Immigration and Customs Enforcement's Homeland Security Investigations initiated an investigation and "seized the sword as a possible Iraqi cultural artifact." 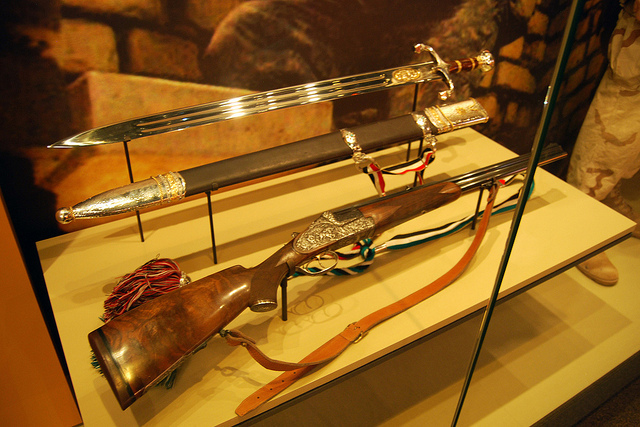 The investigation concluded based on an examination -- involving the State Department and the Department of Defense -- of the "regulations surrounding the importation of war trophies from Iraq" that "this ornate ceremonial sword cannot be considered a modern battlefield weapon and is therefore not eligible to be exported as a war trophy." It also, rather importantly, concluded that the "historic sword" constituted Iraqi cultural property under Office of Foreign Assets Control regulations. I will have more to say on the legal issues soon, but for now suffice it to say that the DHS action raises some problems and questions, not the least of which is, if DHS is treating that Saddam sword as "looted" cultural property that needs to be returned to Iraq in order to "ensure that current and future generations aren't robbed of their nation's history," what about this other Saddam sword on display at the National Infantry Museum in Columbus, GA? National Infantry Museum, "Exhibit: 'Saddam Hussein Sword & Rifle"
A request to the National Infantry Museum for verification that this sword is still on display went unanswered. UPDATE: The National Infantry Museum has confirmed that the exhibit containing Saddam's sword remains just as it is pictured above and that there are no plans to change it in the foreseeable future.